Greek coffee is a strongly brewed coffee that is found everywhere in Greece. It's similar to the coffee served in surrounding countries and is an integral part of the country's culture. Quite often, travelers are captivated by the rich flavor and want to bring that taste home with them. Making traditional Greek coffee requires a specific style of coffee pot, called a briki, and a fine grind of coffee beans. It can be served as sweet as you like it, and you can skip the sugar altogether. Much like many European styles of coffee, it's designed to be shared with family and friends and is often enjoyed slowly while visiting. Greek coffee is basically the same thing as Turkish coffee. Like Armenian coffee, Cypriot coffee in Cyprus, Serbia's domestic coffee, and Bosnian coffee in Bosnia and Herzegovina, the term "Greek coffee" is Greece's way of laying claim to something that is very much a part of their culture. Since it is so similar to other coffees in the region, the origin of this style of coffee is disputed. Turkey, along with other areas in the Balkans, the Caucasus, the Middle East, and North Africa lay claims to creating the drink. This has often been backed by dicey political relationships between the nations. For example, Turkey invaded Cyprus in 1974, straining relations between Greece and Turkey. Those events prompted the name change from Turkish coffee to Greek Coffee. Like Turkish coffee, Greek coffee is made with a fine grind of coffee (sometimes called a Turkish grind). It is boiled in a tall, narrow pot known as a briki, cezve, or an ibrik. Greek coffee is served with grounds in the cup and often a demitasse cup. The grounds are allowed to settle as the coffee is slowly sipped. 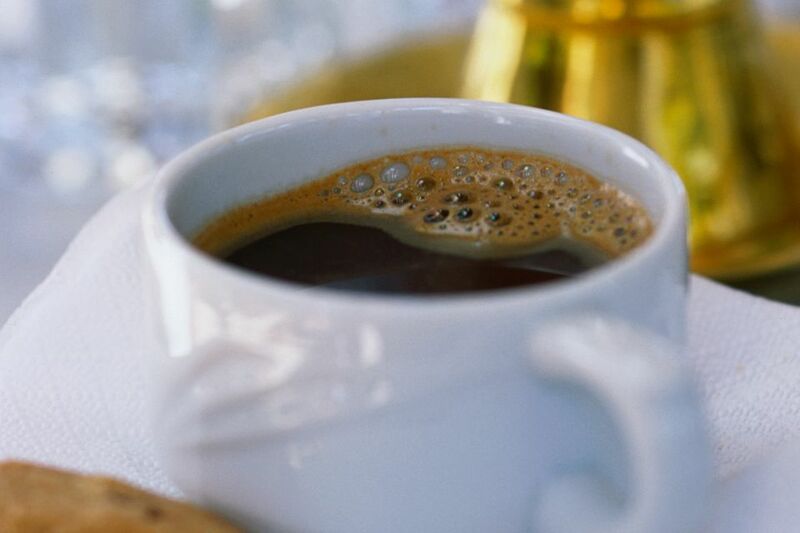 The relaxed pace of drinking Greek coffee makes it ideal for social gatherings. It is not uncommon to see people conversing over Greek coffee at a local cafeteria (a Greek cafe for men and women) or kafeneio (a Greek coffee house for men). It is also often served to visitors and guests in Greek homes. It's not uncommon for a typical Greek coffee break to last over 90 minutes. This is ample time to chat, catch up, gossip, and let those grounds settle. The grounds/dregs, which settle to the bottom of the cup. The liquid coffee, which is strong and thick. The foam, or kaïmaki (pronounced kaee-MAH-kee), which should be rich. Another variation on Greek coffee is sweet boiled coffee, or glykys vrastos (pronounced ghlee-KEE-vrah-stohss). This drink is boiled more than once and does not have the foam. Greek coffee is typically served with a glass of cold water, much like the traditional coffee served in Czech coffee houses. It is also sometimes served with sweets such as cookies. Though it is traditionally served black, some young people prefer to order a "double" Greek coffee and add milk to taste.